The loggerhead is one of only seven species of marine turtles still in existence today. Adult loggerheads can be up to 3 feet in length and weigh as much as 350 pounds. These turtles are believed to have a life span of 50-65 years. The loggerheads’ name refers to the size of its head, which is larger in proportion to its body than other marine turtles. The head and upper shell (carapace) are dark and reddish brown; the flippers and lower shell (plastron) are light yellow. The outer layer of plates on the shell and head, called scutes, can be used to distinguish the various species of marine turtles. The loggerhead turtle (Caretta caretta) was listed as a threatened species in 1978 under the Endangered Species Act and the State Nongame Act. They are residents of the open ocean and make their way onto the Kiawah beaches during the nighttime hours to dig a nest and lay their eggs. In coastal waters, loggerheads eat primarily whelks, crabs, fish, sponges and jellyfish. Nesting activity typically begins in mid-May and will continue into early August. Nests normally contain between 100 and 150 eggs. 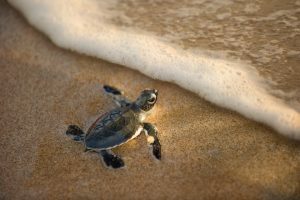 The eggs will hatch in approximately 2 months and the hatchlings will make their way down the beach and into the surf. 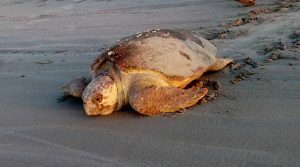 Female loggerheads are quite wary when they come ashore to nest and can be easily frightened or disoriented by lights or loud noises. Please do not approach or disturb nesting turtles and abstain from shining lights at them. 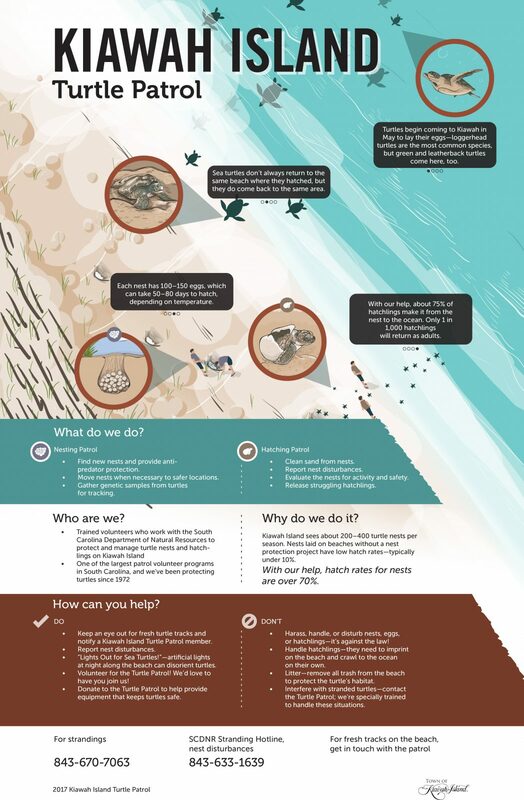 Nesting efforts are monitored on our beaches by a group of resident volunteers each year. The Turtle Program has been in existence since 1973 and the Town of Kiawah Island has provided funding and logistical support to the program since 1990. During the nesting season, volunteers patrol the entire beach by truck each morning to locate nests laid the previous night. An attempt is made to locate the actual nest and mark it with a numbered post. Nests which are located too low on the beach are moved landward in order to protect them from being washed over by high tides. When nests begin to hatch, numerous groups of volunteers patrol sections of beach daily to check for emergence of hatchlings. At some point after hatching, each nest is excavated and an inventory is taken of the nest contents. Detailed records are kept of all activities and a report is prepared annually for the South Carolina Department of Natural Resources. The graph below shows the annual nest totals for Kiawah Island.